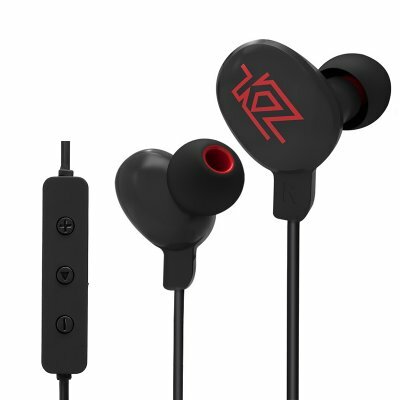 Successfully Added KZ HDSE Bluetooth Earphones - Build-in Mic, Volume Control, Hi-Fi Quality, 99dB, 10H Working Time to your Shopping Cart. Turn up the volume and enjoy your favorite tracks in audiophile quality with the KZ HDSE Bluetooth headset. Coming with three different size earplugs these stylish and high-quality earphones guarantee a comfortable fit for all its users. Simply sync them with your smartphone and enjoy hour’s worth of music – with these wireless headphones you will be able to listen to your music and even answer phone calls without the need of ever taking your cell phone out of your pocket. Supporting the APTX audio codec this wireless headset is specifically built for transmitting high-quality audio over Bluetooth. So crank up your volume with this headset that supports up to 90dB and enjoy all your music in stunning quality without being interrupted by any outside noises or disturbances. With its Hi-Fi sound quality, this headset truly differentiates itself from the competition by delivering the highest and purest sounds out there – guaranteeing a music experience like never before. Featuring an 110mAh battery these wireless earphones provide you with over 10 hours of continuous usage time. The next time when you head out on you a road trip or simply want to do some exercising you no longer have to worry a quiet and boring environment as with these headphones you’ll be able to non-stop enjoy your tracks straight from your smartphone’s music library. With its built-in high-quality microphone this headset does not only allow you to listen to music but also offers you a platform through which to easily answer incoming phone calls. No longer will there be the need to dig through your bag or search for your smartphone when you receive a call – with this wireless headset and its intergraded remote you will be able to answer calls, adjust volume, and switch in between songs with the touch of a finger. This KZ HDSE Bluetooth headset comes with a 12 months warranty, brought to you by the leader in electronic devices as well as wholesale electronic gadgets..